Travel deep beneath the streets of modern city to underground Rome, explore the Roman crypts, graves and catacombs,and get a taste of the archaeological lasagna that we call Rome. Join us on this journey to the underground Rome buried deep under the busy streets, and uncover the hidden treasures of this wonderful city and its glorious past. On this tour we visit three venues unlike anything you have ever seen. The venues on this tour are easily the most fascinating venues of them all: underground crypts, ancient frescoes, burial sites, tombs of Popes and layers of Rome going all the way to the first century AD. And the best thing about this tour is that you do not have to use your imagination to understand how people lived and died nearly 2000 years ago in ancient Rome, you see it and feel it. 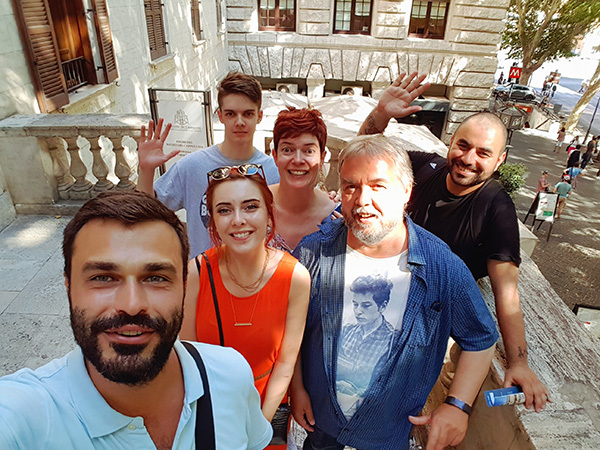 Our groups are never larger than 15 people for this tour, and we physically cannot bring more people in at once, because we want you to experience everything first hand, be right next to the guide in these dark and macabre underground sites. We use headsets on this tour to make it even more interesting and easier to follow, and we use the best guides to make this tour really special for you. Our guide was a wealth of knowledge, the catacombs were amazing and the capuchin crypt was an eye-opening experience. We start with the ancient catacombs built in the second century AD, and located outside the city walls. Catacombs of Rome were excavated or dug by the ancient Romans to bury their dead almost 2000 years ago, they are extensive networks of tunnels in some cases 10-20 km long. 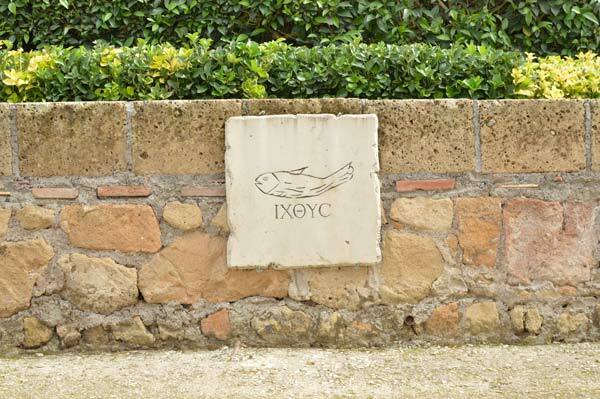 With the help of your expert guide you will walk the narrow corridors of these ancient cemeteries, visit underground chapels and burial chambers, and admire early christian arts. The catacombs were dug when the Christianity was still illegal and Christians used these dark and cold, underground tunnels to secretly gather, pray, worship and evangelize. The second venue is Basilica of Saint Clement, this place is perfect example of how the city was built over thousands of years. In this beautiful church you can literally travel in time, because there are four layers of history of Rome under one roof. In the second half of 19th century, during repair works, the workers discovered that there was something beneath the main building, the excavations began and lasted for nearly 50 years, the result was overwhelming even for the seasoned archaeologists. What they discovered was: a 4th century church on top of a 2nd century pagan temple on top of a public building built in the second half of 1st century. It was an incredible find that demonstrates perfectly the archaeological lasagna that is Rome. The third and last venue is the Roman crypts or the Capuchin crypts. This place will leave you speechless! 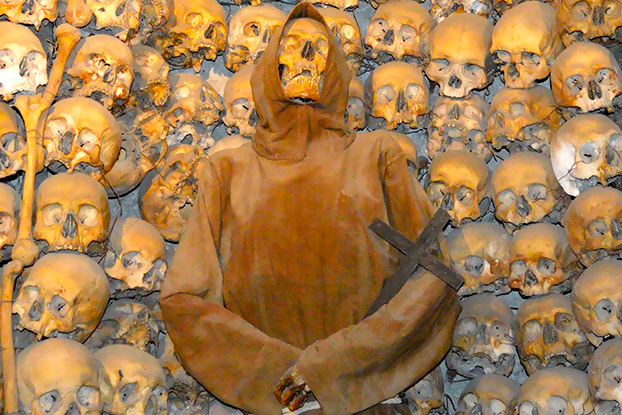 The Capuchin Crypts is a very strange place and yet it is a place of peace and meditation. 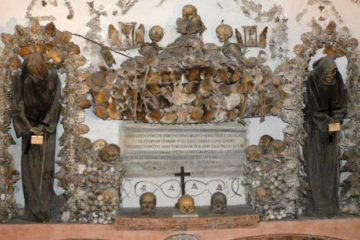 In the first quarter of 18th century Capuchin monks who lived in the new Capuchin convent, had decided to decorate the crypts of the church with the remains of their dead brethren. Using almost 4000 skeletons they were able to produce a very macabre yet beautiful work of art. The crypts are a series of 6 small rooms, 5 of which are fully covered in human bones: chandeliers, clocks, hour glasses, skull and bones, altars, and many more symbols were created using real bones. For many travelers this place becomes an unforgettable highlight of their trip to Rome. It is very easy to book with us, just choose the number of people and the date and click book now button. Roman catacombs are dark and spooky, just like we imagined, the time machine church was amazing and the bone chapel really creepy 🙂 very unusual, but interesting tour. This tour is AMAZING! I already had this on my “things to see in Rome” list and worth every expectations! Our tour guide was superbe. The tour started on time from Piaza de la Republica includes 3 venues Catacoms of san Calisto , San Clemente Basilica and Cappuchin Crypts.Our driver Enzo was excellent. This was the best tour we experienced during our trip. We enjoyed the Underground Rome Crypts Graves and Catacombs. We met the guide, Julie and the rest of the group in Piazza della Repubblica.The driver was already there and we started the tour on time. The first venue was The Catacombs of San Callisto right on Appia Antica with ancient frescoes, crypts and tombs of Popes. 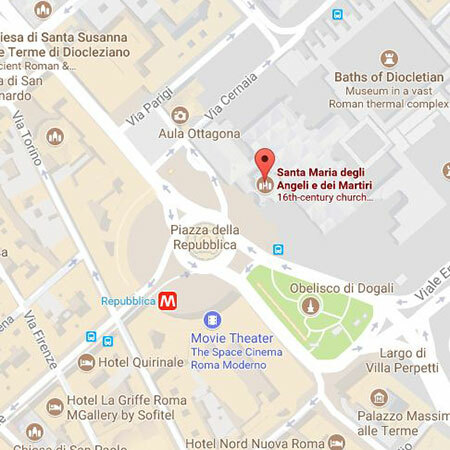 We stayed there 1 hour and then went to San Clemente Basilica, near Colosseo. This church has 4 layers with even a temple of Mythra. The tour ends in the Cappuccini’s Crypts in Piazza Barberini. 6 full of bones used as clocks or chandeliers. Thank to More of Rome and Julie our trip was special!!! Really enjoyed ou guide and his deep knowledge and respect for the venues as well as the insights he provided, but for Rome in general. 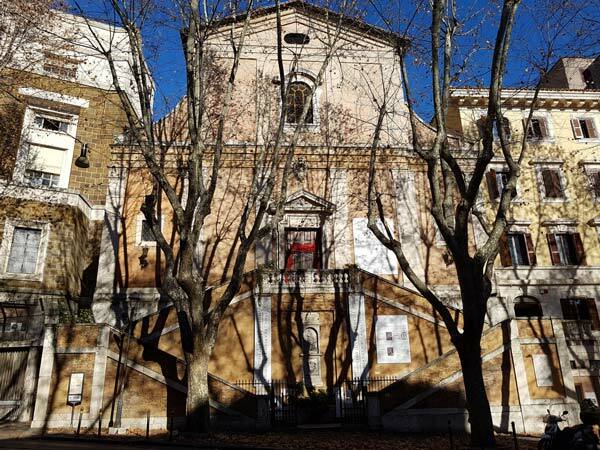 Would highly recommend this tour to others looking for a unique view of Rome and its deep history. This tour is creepy and fascinating at the same time ( especially the bone chapel) Our guide Paul was wealth of Knowledge, the was he described the things along the way was outstanding! Very unusual, but great experience! Catacombs and the Crypts were the highlight of all our tours in Rome. We did this tour with our three kids and they LOVED IT! Our Guide Dimitry was very good with them and helped them discover the huge catamobs we visited and the bone chapel in the city center . We all lerned so much! Our guide was fabulous and entertaining . I will recommend More Of Rome tour agency to all my family and friends.The tour are kept under 15 people and it is just great. No crowd and we could talk with the guide and ask questions. We can’t wait to come back to Rome to book again with More of Rome! Due to our “private” tour it was very special. Very detailed explanations. We will surely recommend Dmitri and More of Rome. Fascinating!My friend and I truly enjoyed ourselves. It was clear that our guide was passionate about the locations that he showed us. He provided us with an abundance of information, but it was never overwhelming; if the subject of Catacombs can ever be considered “entertainment,” well, our guide made it so. We were entranced by every detail he introduced us to! The catacombs and St. Clement’s are truly captivating. We are grateful that we happened upon More of Rome—we were planning to tour on our own!—but we would have truly missed out if we hadn’t done this tour. 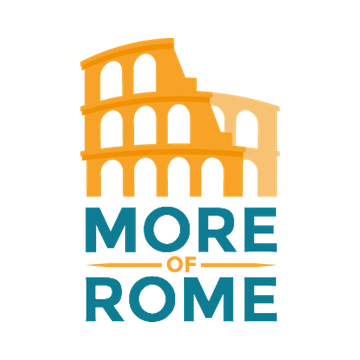 Thank you, More of Rome; we will surely recommend you to anyone we know who travels to Rome. .The tour of catacombs and crypts went smooth from A to Z, it was easy to book, the guide was there on time, driver was incredibly skilled and of course the venues were breathtaking.